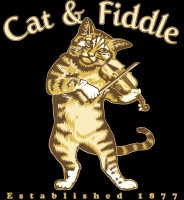 Here’s our original “Cat & Fiddle” design, certain to appeal to you whether you’re a lover of domestic felines, violins, Mother Goose nursery rhymes, English pubs, or all of the above! We’ve added “Established 1877” at the very bottom, just to give it an extra “air” of vintage-looking appeal. Don’t ask why that particular year – it was just pulled out of “thin air”, actually! Get this great image on a t-shirt, hoodie, bag, stein or other fine apparel or giftware item, exclusively from GearGems.